Studio 360 is a fun, interesting public radio program produced at WNYC in New York and focusing on the arts and popular culture. 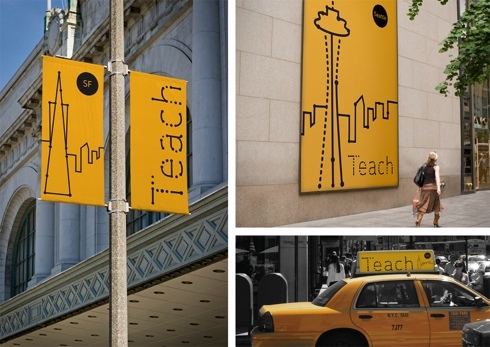 Occasionally they hire graphic design firms to re-imagine the imagery for a part of that culture.Â This time around they decided to redesign teaching, or at least the graphic representation of teaching, and the results are bright, interesting, modern and, at least for me, extremely compelling. Although you can quibble with the use of school-bus yellow (and some did in the program’s comment section), this work is still many steps up from any illustration using the nth variation on an Apple. Take a look at all the results and, especially if you’re interested in the creative process of design, listen to the discussion with the designers. I couldn’t find any indication that they are releasing this work under a Creative Commons license but I certainly hope so. From the ever insightful This is Indexed, a simple illustration of why improving student learning cannot happen in many parts of this country. Despite what the clueless creators of NCLB believe, schools cannot educate all kids without society also finding solutions to the major life problems, like poverty, they face outside of school. “A picture is worth a thousand words” goes the old saying. This is from the National Geographic Blog and clearly illustrates several factors in the debate over national health care in ways that pages of text never can. Do we teach our students to interpret information in this form? More importantly, do we teach them how create a visualization of data similar to this one? Or do we just teach them to read? On the mathematical side of things, one thing the chart shows most effectively is that there is no direct correlation between amount of money spent per person for health care and at least one desirable effect: life span. What else might students (and others) read in this picture?